Vintage From Paul is pleased to offer Walker China Co Restaurant Ware Green Geometric Bread and Butter Plates. These Walker China Restaurant Ware Green Geometric Bread Plates are identical in design to the Warwick Plates which we also have linked to these Walker plates. The Walker China Restaurant Ware Green Geometric Bread Plates measure 6-1/2 inches in diameter. Each of the availableWalker China Restaurant Ware Green Geometric Bread Plates is in Mint condition with no chips, cracks or discoloration. The graphics are crisp, the colors vibrant. The Walker China Restaurant Ware Green Geometric Bread Plates appear to have been very gently used, if used at all. 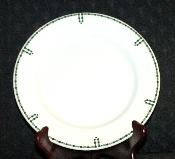 The Walker China Restaurant Ware Green Geometric Bread Plates are marked with "Walker China, Vitrified, Bedford Ohio, 7-31". The date code of "7-31" indicates a manufacture date of July, 1931.